Strawberries besides having a great taste, they also have many nutritional benefits. They are rich in vitamins and minerals and they are used in various medicines in weight loss, beauty and health. Strawberries have a rich antioxidant action. One cup per day (corresponding to 5-8 large strawberries) gives you more vitamin C than the recommended daily dose. The anti-inflammatory effect of the strawberry is due to phenols that reduce the activity of the enzyme COX causing inflammation. Anti-inflammatory drugs inhibit the activity of this enzyme, thus reducing the inflammation found in diseases such as rheumatoid arthritis, osteoarthritis, asthma and cancer. Strawberries have high content of potassium and magnesium, which are very effective in reducing high blood pressure caused by sodium. It is also a fruit rich in pectin, a soluble fiber which helps to reduce cholesterol. Strawberries contain polyphenols which can protect our brains from aging and memory loss. Polyphenols contribute to good memory, health and stimulation. In addition to the valuable antioxidants, strawberries carry many other nutrients and contribute effectively to the prevention of many diseases. Strawberries are high in fiber which makes them a good choice for weight loss. A two-year study published in the Journal of Nutrition showed that people who consumed 8 grams extra of fiber per day (for every 1,000 calories) lost about 4 1/2 pounds. As a rich source of fiber, they help fight constipation and have a laxative and diuretic action that assist in detoxifying the body. Strawberry is one of the best cleaning tools for our teeth with excellent bleaching properties of specific stains left by coffee, tea, cigarette, while protecting them from the accumulation of dental plaque. Simply crush strawberries and rub your teeth very well with the pulp. Strawberries are considered among the most polluted foods with pesticides, so buy with care. Be careful not to have wrinkling and injuries, be clean, uniform, with bright color, green leaves on top and visible small hairs on their surface. Buy those with small or normal size. Do not exaggerate in quantities as they spoil quickly. Organic strawberries are a good solution, they just cost more. People with ulcer, inflammatory bowel disease and irritable bowel are better to avoid eating strawberries as they are held responsible for allergic rashes due to their pile surface. Also people who are suffering from kidney disease, thyroid, or are having problems with the gall bladder but are not taking any medications. In general, people with allergies should be carefully when they consume strawberries so if you notice that you are allergen to them, you should conduct your doctor first. 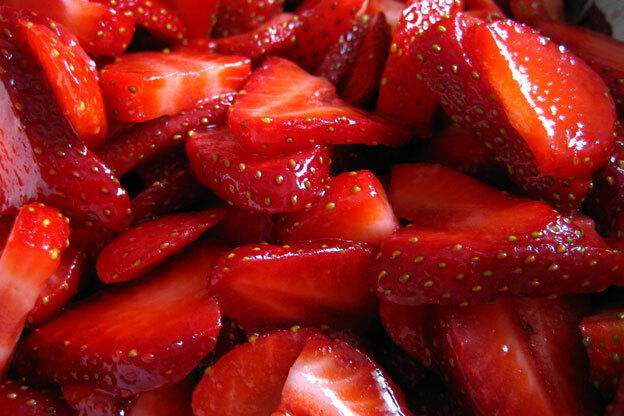 Strawberries are a delicate fruit so you should not leave them at room temperature for more than a couple of hours. You can, however, keep them in the fridge for two days provided that you have not washed them and you kept the green leaf on them. The strawberries should be stored in the refrigerator in a plastic container with perforated lid to allow the passage of cold air. You need to wash them thoroughly before consumption because the rough surface favours the accumulation of dust and fertilizers. Do not leave to soak, when you wash them: they lose their fragrance and colour. It is preferable to put them in a colander, and run plenty of water. Make sure to eat them immediately after washing.